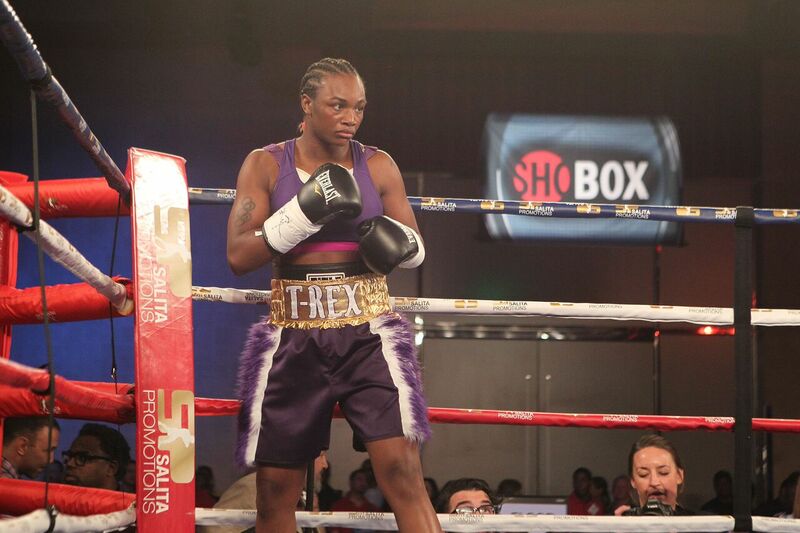 After moving down in weight to claim the IBF and WBA middleweight championships against Hanna Gabriels 18-2-1 (11) in her native Detroit on Friday night, outspoken two-division titleholder Clarissa “T-Rex” Shields 6-0 (2) lashed out at her rival Christina Hammer 23-0 (10) who retained her WBC and WBO middleweight championships by virtual shutout against Tori Nelson 17-2-3 (2) on the same card. While Hammer was dominant in her bout, Shields had to recover from an early knockdown to box her way to a win in a fight that was much closer than the official scorecards suggested. “But I let her know I’m more than ready for a fight against her. She wanted me to lose tonight, but I wanted her to win because I want to fight her,” continued the 23-year-old two-time Olympic gold medallist. The 27-year-old German won the inaugural WBO middleweight title against Bermuda’s Teresa Perozzi in 2010 and has defended it 12 times since. In 2013 she won the same title at super middleweight but moved back down to 160-pounds without defending it. In 2014 Hammer made an ambitious move down in weight to face big-punching Anne Sophie Mathis, 27-3 (23) at the time, for the vacant WBO junior middleweight title. The fight ended in a controversial no contest. “I’m really looking forward to fighting Claressa,” said Hammer. “She will try and fight me on the inside but my footwork and my reach will make the difference. Shields shot to fame after successfully defending the Olympic gold medal she won in the middleweight division at the London Gams in 2012 with a repeat performance at Rio 2016. But her brashness has rubbed some people up the wrong way. “I’m the greatest of all time. I showed who I am. Now, I’m really dangerous because you can even put me down, and I’ll still come back to win!” she said after her victory on Friday night at the Masonic Temple in Detroit, Michigan on Friday night.